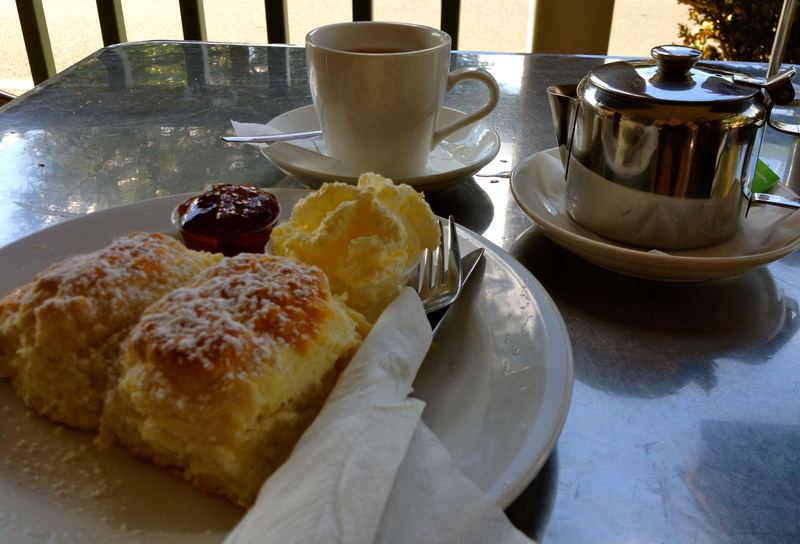 It’s a tough choice deciding where to have a Devonshire Tea in Kurrajong village. There are three cafes literally side-by-side offering this delight, so which one to choose? I say go where you feel most comfortable and where the DTs are good (but that’s subjective). Feeding Frenzy Cafe differs from its neighbours in that it has a deck out the back, which is open sided in the warmer months but can be enclosed in inclement weather. There are also lots of tables indoors and some out the front on the footpath. There are no expansive views from the deck but it’s light and bright indoors thereby creating a cosy nook. The cafe attracts a lot of drop ins for takeaway coffees, so it can get busy at lunchtime. My two scones are dry on top and taste more yesterdays’ than freshly baked. The jam is better than most cafe jams and the thickly whipped cream has a hint of vanilla. Both have generous servings so you can load up the scones. Wherever you end up in Kurrajong, you can’t go wrong – the village has a lovely serene ambience overlooking the Sydney sprawl in the distance. Tea: A small but interesting range of Dr Tea loose-leaf teas served in a small teapot. Overall: A simple comfy cafe with deck dining out the back. You can’t miss Pie in the Sky Roadhouse on the Bells Line of Road as it has a massive gravel carpark with plenty of room for trucks to swing in to. They are best known for their homemade pies minus the trans fat – that’s what they say – but I don’t eat pies so I can’t comment on their quality, but I hope they are better than their Devonshire Teas. Advertised on the menu board as being served with double cream, I am just a little bit excited, but realise my excitement is premature when it arrives with cream that needs a lot more whipping. The scones have a tough and leathery crust with a nasty aftertaste. The jam is average and has no chance in rescuing the rest. What a shame as the lady serving me is lovely. Tea: A small variety of loose-leaf teas served in a good size pot. Overall: Unless you want a pie, there’s other places to stop. It’s a warm day when I visit Seasons of Kurrajong, and I wish I’d chosen a table out in the courtyard. Instead, I sit and gaze at the expansive views of Sydney’s western sprawl, feeling stifled behind the floor to ceiling glass. It’s cosy inside (perfect for winter days) with more dining in the courtyard and out the front on the footpath. I don’t see the scones on display even though I’d called ahead to check, so they must be hidden somewhere in the kitchen. 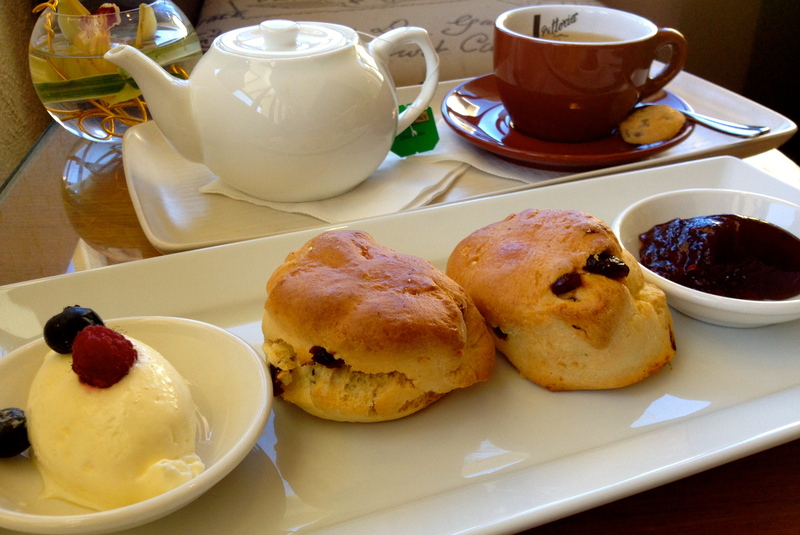 Worth the diversion, the scones are feather light and up there with the best of them. A big lump of jellied strawberry jam seems almost too robust for such delicate scones, and the particularly small dish of double thick cream needs to be at least double in size. The fresh blueberries are a nice touch. Tea: A basic selection of tea bags served in a small teapot. Overall: Cosy interiors with smashing views. Perched on a ridge overlooking the Blue Mountains National Park and surrounded by an ever-changing botanical garden, Restaurant Tomah has floor to ceiling glass windows to make the most of the enchanting views. If the weather is mild it’s lovely to sit on the deck, and what a great place to be to hear and feel the surrounding nature? 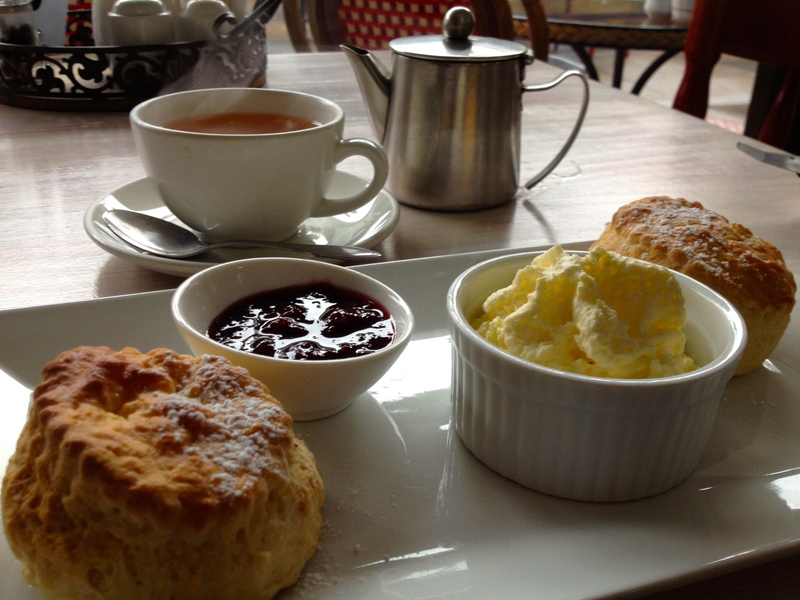 The menu has a delectable choice of sweets and says that the scones are homemade. It’s still early in the day and my scones have that ‘I’ve been heated up in the microwave’ texture, which is a little surprising as this is no’ hot chips and burgers, pay at the counter’ type of place. The raspberry jam is wonderful and although the cream is whipped, it could not have been served in anything smaller if they tried – the quantity falls way short of the need. Tea: A broad range of black, green, organic and herbal silver tip loose-leaf teas. Overall: Relaxing and great to visit in any season. If you’ve ever driven from Sydney to Lithgow via the Bells Line of Road, you’d understand what a sigh of relief you feel when you finally leave North Richmond and start the climb up towards Kurrajong. Beyond here is where you start to finally shake of the city and the traffic and traffic lights you had to tackle to get this far. Tutti Fruitti is one of the many farms that remain open to passersby. 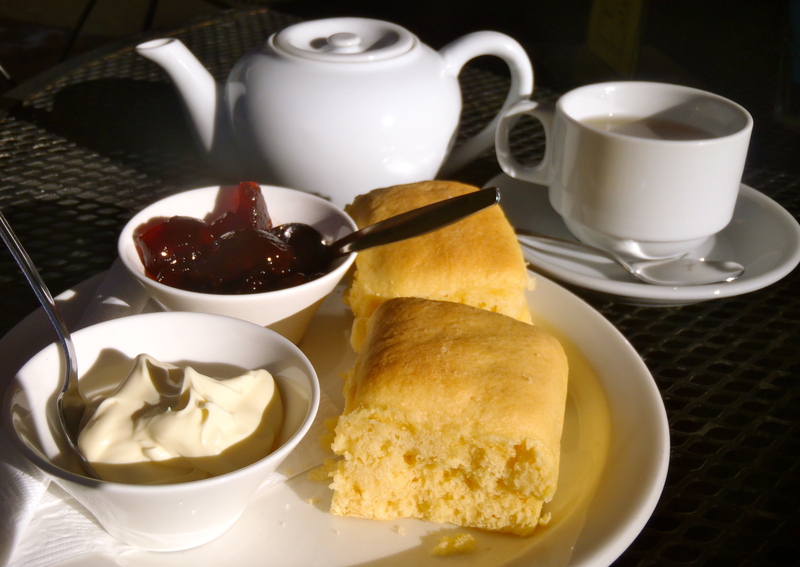 It’s small and sweet, as the name suggests and does a damn fine Devonshire Tea. I sit out on the small deck at one of only two outside tables admiring the blooming spring flowers and the unseasonal very warm weather. 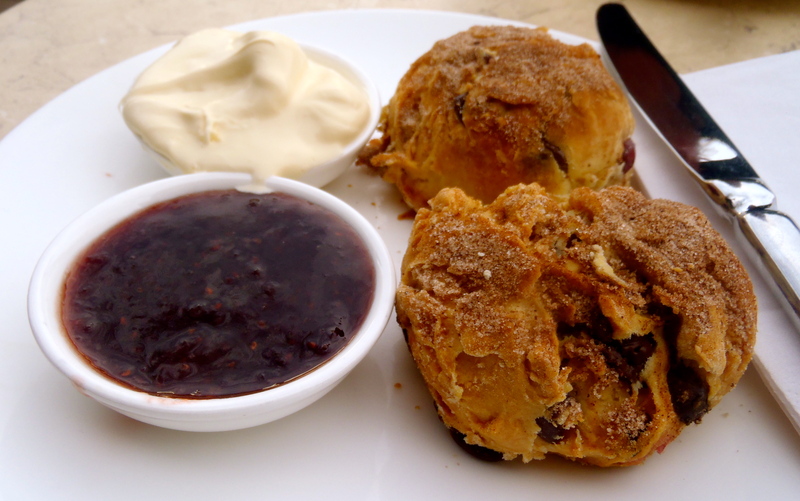 The Aussie damper-like scones are fresh and definitely home-baked and the small jar of cherry jam is one that’s produced by the farm. If the can-whipped cream were any lighter it would have been liquid, which is unfortunate, because with thick cream it would have got an overall nine out of ten! Love the way the cream is served in the mini teacup. Tea: A few varieties of tea bags served in a funky pot and cup for one. Overall: True blue homemade country-style scones. Opened just over a year ago, the bright and modern Blue Mountains Cultural Centre is just off the main street of Katoomba and affords great views out towards the Jamison Valley. Combining the Katoomba library, Blue Mountains City Art Gallery and World Heritage Exhibition, it also has a well-stocked gallery gift shop, and a busy cafe that’ll keep you cool as a cucumber on hot summer days and warm as toast during winter. I call before visiting to check whether they serve scones and am told that they are serving them at the moment while the vintage exhibition is on, so best to check. The scones are displayed on top of the counter and are described as house made scones served with raspberry coulis and whipped cream. They definitely taste like they are homemade and fresh, although they do arrive without being heated up (even a little). The raspberry coulis is more canned raspberry jam (a reminder of my childhood) and the cream is freshly whipped. Overall, thoroughly enjoyable! Sit in or outdoors. Tea: Six choices of Blue Mountains loose-leaf tea served in a funky infuser and a small amount of extra hot water. Overall: Also worth a visit for the gift shop, views and exhibitions. 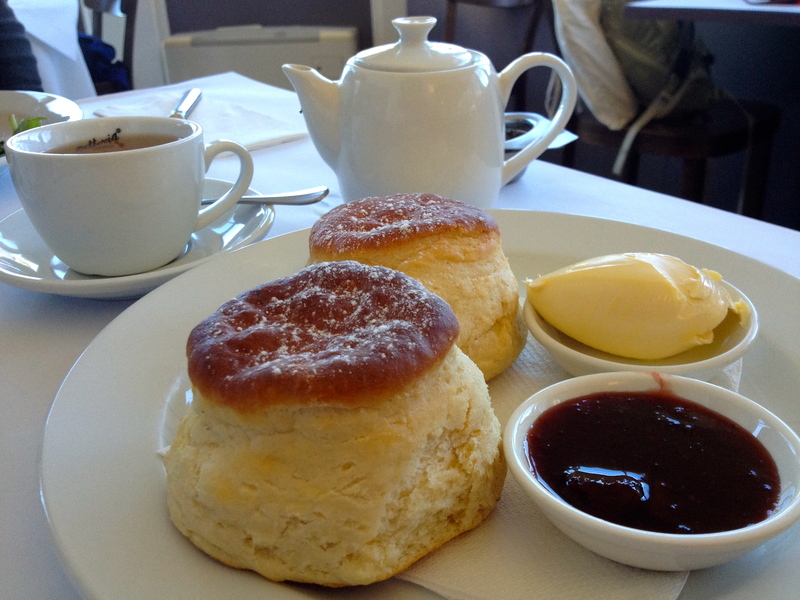 Over the years I have enjoyed a Devonshire Tea or two at Champagne Charlies, the lobby bar at The Carrington Hotel in Katoomba. The art-deco landmark is still holding on to its grandeur, although these days it does remind me of a combination of ‘Faulty Towers’ and the recent movie ‘The Grand Hotel Budapest’ (in its latter years). It’s Sunday afternoon in the middle of the Yuletide Festival, so it’s busy. People are rolling in and the skeleton staff just can’t keep up. It’s also a tad chilly in front of the bar (the lounges in front of the fire are all taken) even though there’s a massive albeit slightly defective heater on the wall beside us, so we are forced to keep our coats on. Still, I just love it here – we just don’t have a lot of buildings in Australia (compared to Europe) that transport us back to another era. 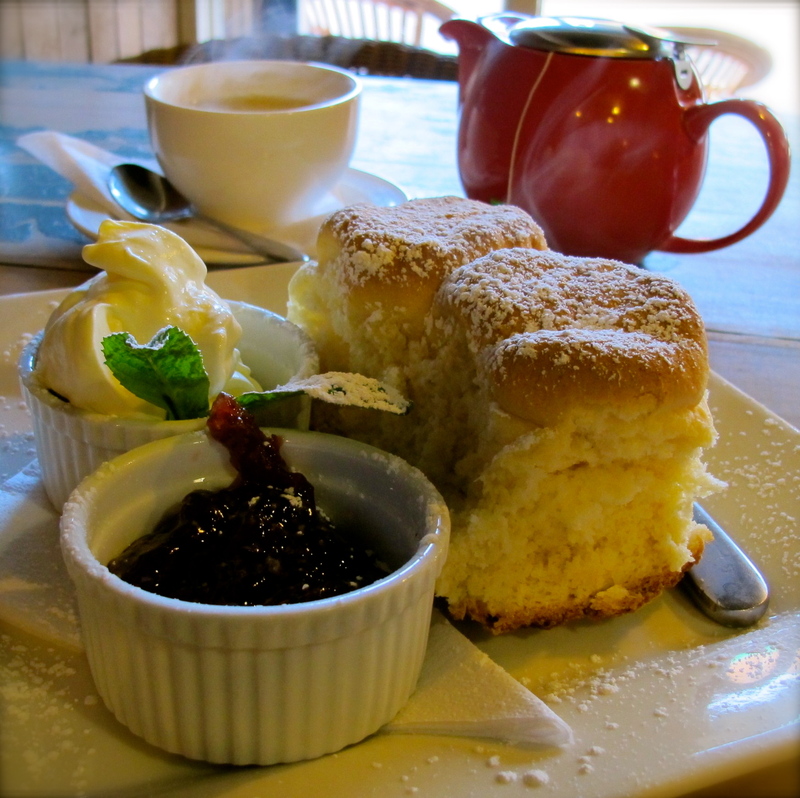 After placing our orders at the bar (all very comical), our scones arrive well before the drinks. The scones taste like they are straight out of the oven, big and slightly crispy on top. Although agreeing that the scones are mighty fine, my fellow diners are not impressed with the accompaniment of blackberry jam/cream combo that’s served in the same dish. There’s not enough of both to easily lavish on the scones for starters and you have to either delicately dig in to the jam and cream separately or just give up and smear them on together, which isn’t ideal. I do like the jam though, and the cream is firm (from the fridge) but a tad sweet. Shame about the slow service and the tea arriving over 10 minutes later than the scones. Available from Thursday to Sunday. Tea: A small variety of black and herbal teas served in a good-sized pot. I know visiting anywhere that requires customer service on New Years’ Day is probably not the best idea. It’s 11am and we are the only customers at the Katoomba Falls Kiosk, and still the service is a little lax. Not slow or bad, just a tad blasé. From it’s historic exterior, the Kiosk has always intrigued me, but now, with doors thrown open to the warm summer’s day, the cafe is rather sterile and nothing more than an ordinary takeaway joint to lure tourists. It’s in the right spot as everyone driving to Scenic World or walking back from the Skyway, because they refuse to queue again for the return ride, will pass by it. The place has a lovely garden but not many shady tables when it’s hot, however maybe the umbrellas weren’t put out yet? Overall the whole spread is rather average, the scone is passable and fresh enough – not bad, the jam, good enough, but the cream too airy. Considering there are so many great Devonshire Tea options in the area, this spread, one scone and a mug of tea, is way overpriced for both quality and quantity. Tea: A motley selection of tea bags served in a small coffee cup or mug. Overall: Despite the location this cafe is soulless much like the tourist mecca up the road. It’s warm and cosy in Katoomba Street Cafe with the outdoor seating lining the footpath empty, and everyone inside warming his or her feet by the fire. 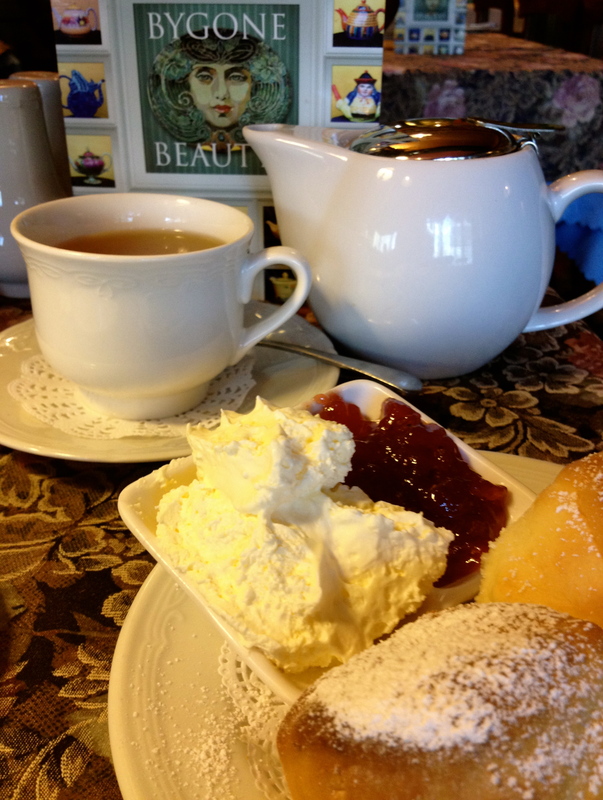 My Devonshire Tea looks pretty, very ‘Christmas in July-ish’ with the green leaves and the red teapot. My scones are quite burnt on the bottom, which needs to be left, but the bulk of them are quite fluffy. The jam is okay, although not enough is provided for the size of the scones, but there’s a tonne of the freshly whipped cream. Tea: A small variety of teabags served in a small pot. Overall: Prime people watching spot with a rustic mountain feel. Overall: A bit touristy but go for the art deco splendour and decor. Opposite the Carrington Hotel at the upper end of Katoomba Street, the Savoy Cafe is a simple art deco cafe with cosy indoor booths and outdoor benches for the warmer weather. The cafe is popular with locals and tourists alike, me, included, and offers reasonable hearty meals that are perfect after a day out on the trails in fresh mountain air. However, considering the fierce competition nearby, the Devonshire Tea is somewhat below par. The small slightly chewy scones are nothing remarkable, as is the jam. 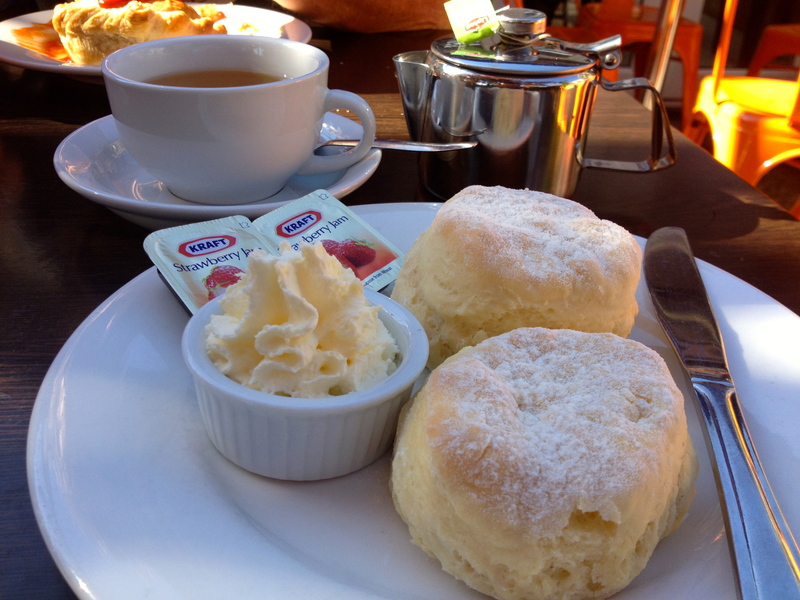 The cream is too light for me, as I prefer my cream clotted or as close to. 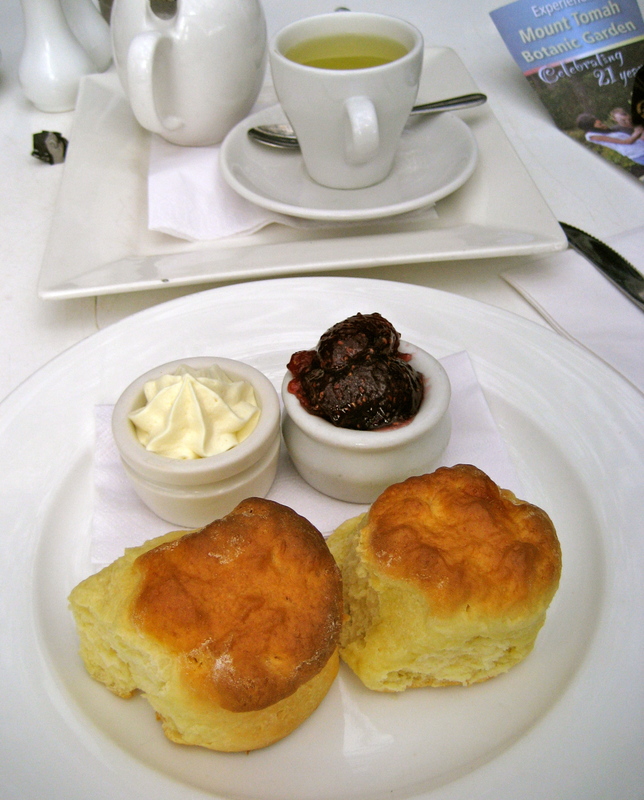 A big plus though is the ample amount of jam and cream served, which would be sufficient for a couple more scones. Tea: A small selection of T2 teas. Overall: A Katoomba institution, but try something else on the menu. During a recent ‘girls weekend’ in Leura with a bunch of highschool friends, I notice a brochure for The Gingerbread House Cafe & Store in Katoomba. Although open since October 2013, this is the first time I have heard of it, despite countless visits to the Blue Mountains. Housed in an 100-year-old restored church which was previously home to a jazz club, a cafe and a French restaurant, the Gingerbread House itself is built within the cavernous structure. Owned by Josophan’s Chocolates from Leura, the shop (within the Hansel and Gretel Gingerbread House) is filled with chocolate goodies and sweets as well as some elegant tea ware. The young staff is friendly and welcoming, and work well with the creaming soda spiders, ginger beer floats and malted milkshakes on offer. Share large tables with other diners, or sit in the courtyard when it’s warmer and watch kiddies play in the garden. My table of six unanimously votes the scones as sensational. Scones with too many fancy ingredients can sometimes come across as ‘too busy’ and miss the mark, but these date and choc scones with a hint of ginger and cinnamon have nailed it. The balance of soft and fluffy on the inside with a crispy outer is enhanced by the perfect combination of just the right amount of dates and chunks of chocolate without overpowering the suggestion of ginger and cinnamon. Scoring extra brownie points is the exquisite housemade berry jam, which is beefed up with fruit rather than sugary syrup. The top quality scones and jam even have me ignoring the freshly whipped cream that’s sprayed out of the same canister that is used for topping up drinks. I can only imagine that whipped cream by an eggbeater would blow this Devonshire Tea through the church roof! Considering they sell cute tea ware (teapots, cups and saucers), it’s a shame that diners can’t enjoy similar tea ware with their scones. Overall: Top-notch scones in a Gingerbread House themed historic church. Just driving through the gates of this beautiful property is enough to transport you in to another world. I arrive late in the day, just in time to take scones and tea in The Lounge, a cosy open area looking out through French doors in to the garden. It’s late on a Friday afternoon, so not particularly busy, but I still have a long wait for my tea. Actually, my well-sized pot of tea arrives about 15 minutes after my scones, and I try to wait as long as possible before digging in to the quality spread before me. The staff are welcoming and friendly, and help create a relaxed atmosphere if you’re not used to opulent surrounds. I am served a plain and sultana scone which are both warm and delectable. To top it off the strawberry jam is rich and fruity and tastes homemade, and the double thick cream is almost clotted. 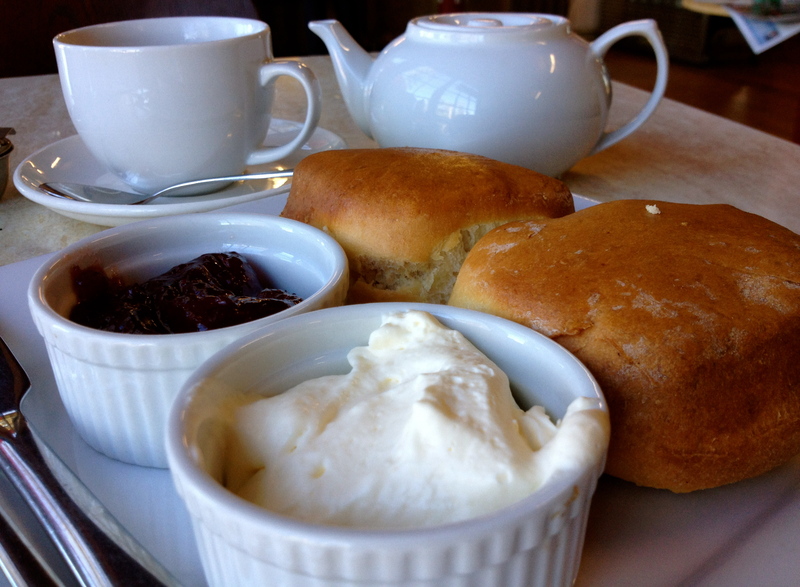 In the higher price range, this Devonshire Tea matched with the surrounds is definitely worth it. Quirky and cluttered with a traditional tea house feel, Bygone Beauties, like most of the cafes in the Blue Mountains can get ridiculously busy on weekends so if you visit then, expect a wait. Be served by very young boys, think highschool or just out of, dressed in penguin suits minus the jackets. It’s all very busy, the place has so much floral and lace that I can’t tell where the tablecloths finish and the carpet starts. There’s real whipped cream and plenty of it, and your standard strawberry jam. The scones are a bit chewy – probably microwaved – but pleasant tasting nonetheless. Before you leave take a look around, as there’s enough to keep you occupied for a while. You might even be inspired to buy a tea set! Tea: A choice of six loose-leaf teas. Overall: Surround yourself in chintz and lots of bygone stuff. 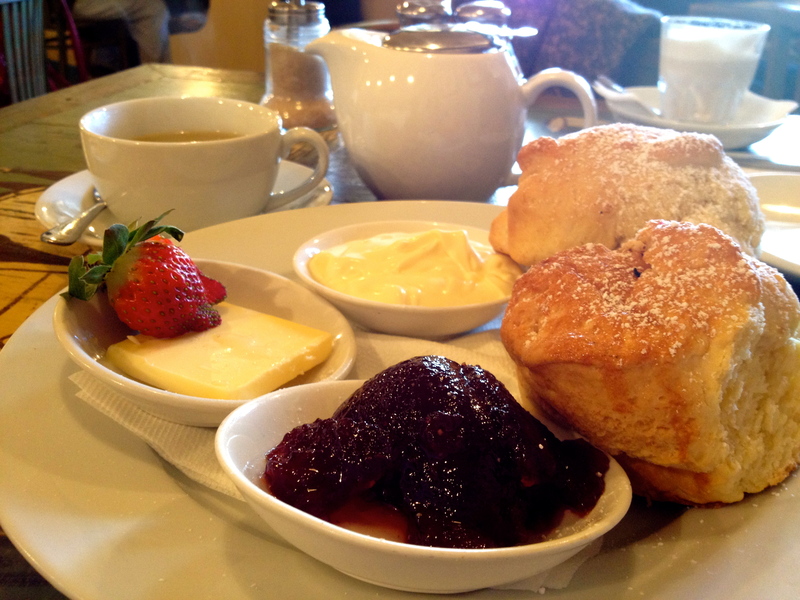 I’ve always neglected to check the French influenced bistro, Cafe Bon Ton, for scones. 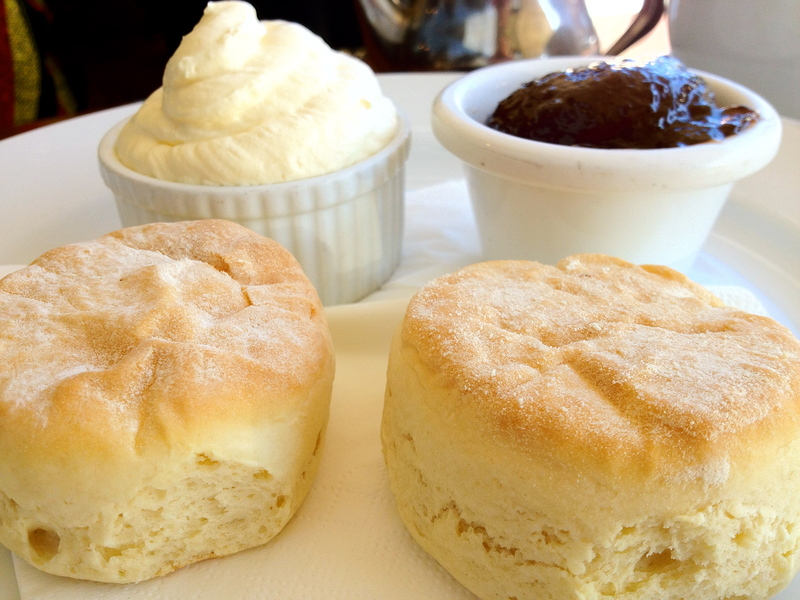 So it was by chance one day when passing that I see ‘Devonshire Teas’ scribbled up on the blackboard – risky business considering there’s at least another six cafes doing scones in Leura. 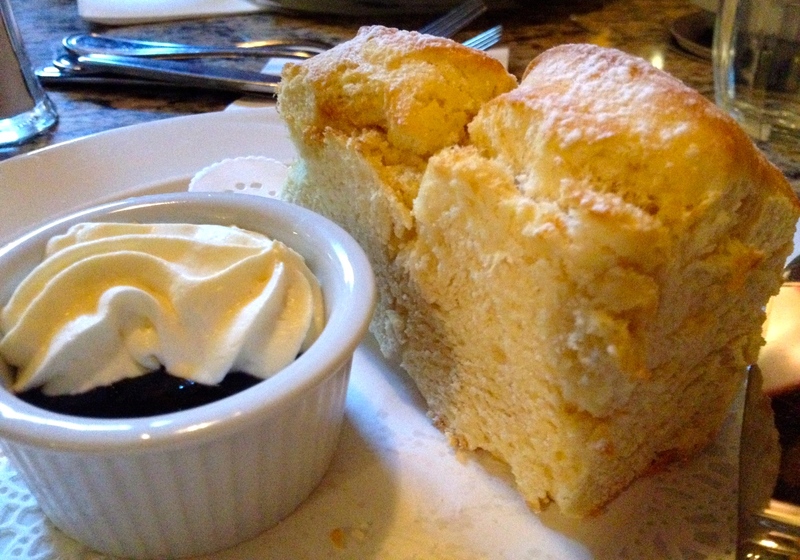 But, not all places are equal, and sometimes I wonder why establishments bother serving mediocre scones. Rest assured it’s definitely not the case at Cafe Bon Ton. Housed in a splendid 1917 historic building, with an inviting leafy garden for the warmer months, the place is sophisticated yet cosy inside, and includes a few tables in a glass atrium that leads out to the courtyard. The scones are big, and look delicious, although they have a slight ‘been in the microwave for too long’ taste. The jam is quite good and even hints as homemade, but a tad runny, and I liken it to jam I have made. 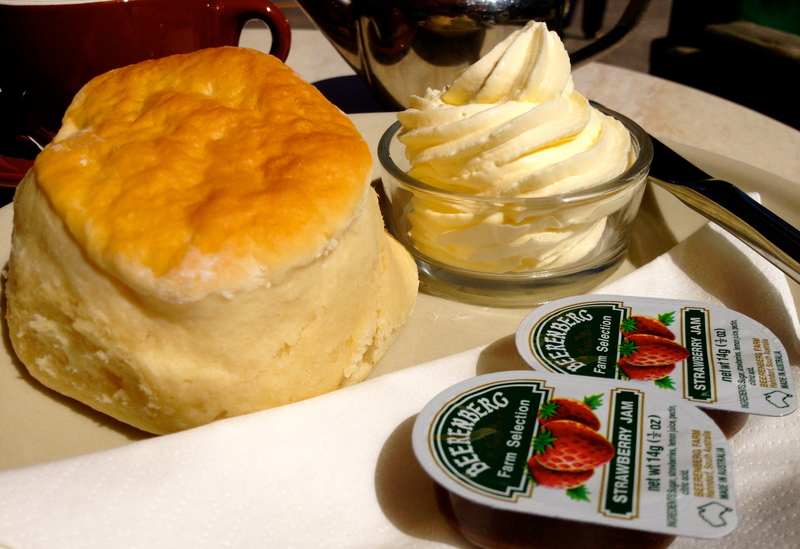 But the star of the show, the crème de la crème of the Devonshire Tea, is the clotted cream. I make the mistake of trying to spread it on top of my jam – no go – it’s so thick I can’t get it off my knife. Tea: A good variety of loose-leaf teas. Overall: The shady garden is a gem for summer outdoor dining. Josophan’s Fine Chocolate’s sister site in Leura, Cafe Madeleine, is easy to miss as the shop front is tiny in comparison to its reputation and the amount of customers trying to get in. I try to avoid expensive chocolate cafes, especially since they have exploded in the past few years and seem to be everywhere. 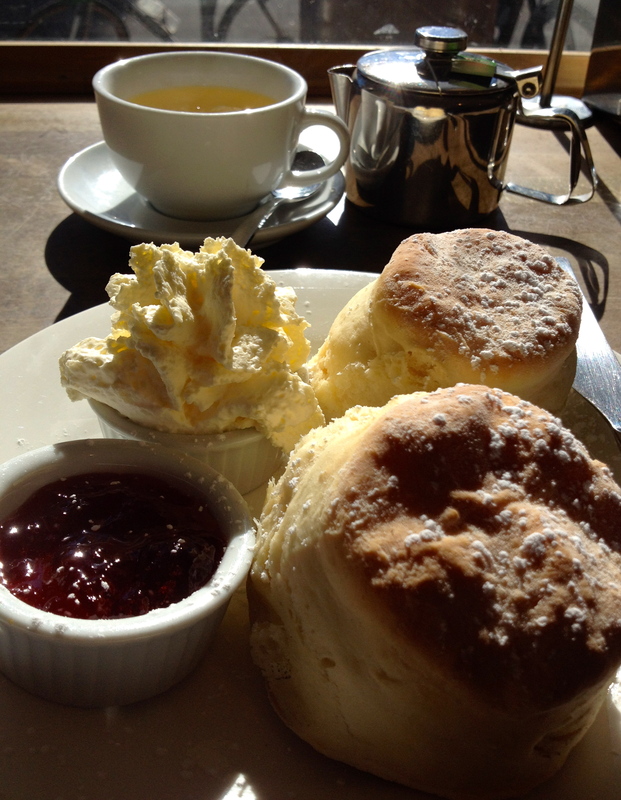 But in the search of the perfect Devonshire Tea I make an exception. I believe that they now do table service, but at the time I visit it is pay and order at the counter, than fight for a table. We’re lucky to get one even if it is outside, as it’s a bit chilly. I go for the cranberry and choc chip scones, which come covered in cinnamon, sugar and are really sweet. There’s not a lot of jam and cream accompanying it, but they’re so sweet it feels unnecessary to add more sugar. The cream is thick and the jam lovely, but plainer scones would have been a better match. Try and visit during the week, rather than the weekend when Leura is crawling with tourists. Overall: Overpriced and very popular. The Everglades Tea Rooms are housed in the 1930s building with seating spilling out into the silver birch shaded courtyard. For cooler weather, cosy up beside the open fire in the living room or enjoy the views of the Jamison Valley from the breakfast room. When I visit, it’s a balmy day in May and we opt to enjoy the sunshine in the garden with the backdrop of gurgling fountains. After ambling around the property, which was built as a mountain retreat in the 1930s for Belgian born Henri Van De Velde, the cafe is the perfect place to absorb more of the solitude of this National Trust property. 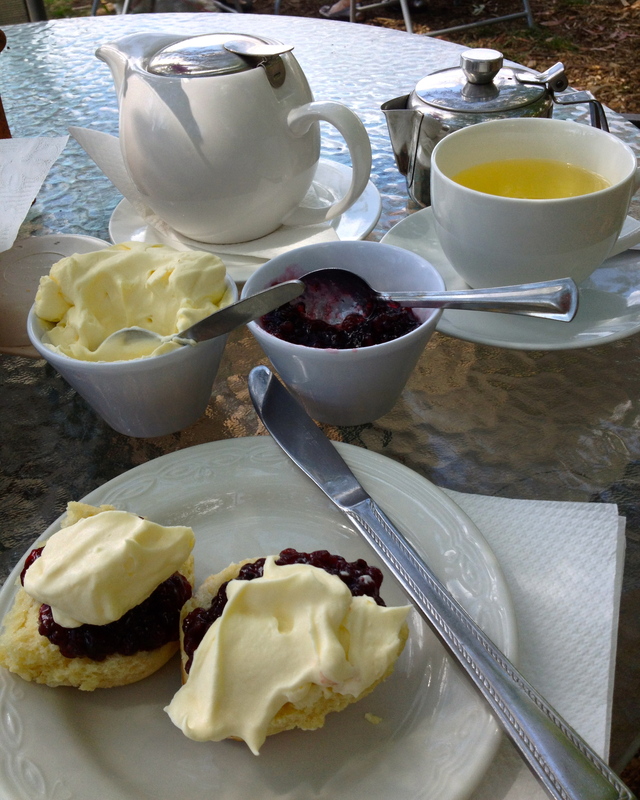 The thick rich cream and the quality leaf tea served in generous sized pots are a bonus as the scones are a bit dry and not particularly complementary to the splendid surrounds. Tea: A selection of loose-leaf teas including herbals. Overall: Chilled out and far from the madding crowds. Nestled on Cliff Drive overlooking the Jamison Valley and surrounded by more bush than homes, the Solitary Restaurant & Kiosk was originally built as The Leura Falls Kiosk in 1913. It was built to service swimmers and picnickers from the Leura Baths, now the Leura Cascades picnic grounds, and initially served tea, scones, ice-creams and apple pies. One hundred years on and the Kiosk are still serving delicious scones to hungry passersby. The historic house has seating in various rooms, and garden seating in the warmer months. The wind is howling when I visit but it’s a beautiful clear day to enjoy the view. I expected the Kiosk to be on the edge of the cliff top but rather there is a road in the way and views are limited. The large scones arrive with impressive jam and cream. The cream is so thick it can be almost mistaken for butter – mmm clotted cream – and the jam is homemade and tasty but a little runny. 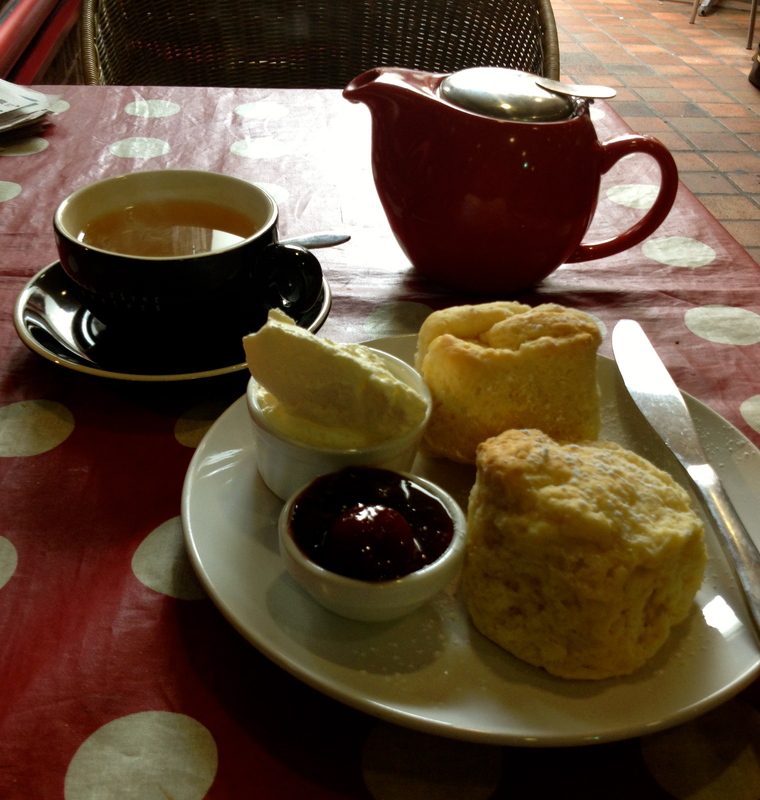 The scones are huge in comparison to the quantities of jam and cream, and a tad chewy. Overall this is a Devonshire Tea not to be missed. Tea: An interesting selection of loose-leaf tea, I tried the liquorice and peppermint. Overall: A wonderful location that teems of history. I first visited Wayzgoose Cafe four years ago to try their infamous flower-pot scones, and I’m happy to say that today they’re still on the menu and as popular as ever. The 1950s vintage inspired cafe, booths and all, has a prime spot on the main drag in Leura’s busy shopping precinct and does well to offer something a bit different in a place oozing with cafes. Wayzgoose Cafe is housed in the former home of the Federal Printing Works which operated until 1980 when it was subsequently fitted out as a cafe. Its quirky name represents roots to the buildings printing past and to food, but I’ll leave it to you to read about the rest. 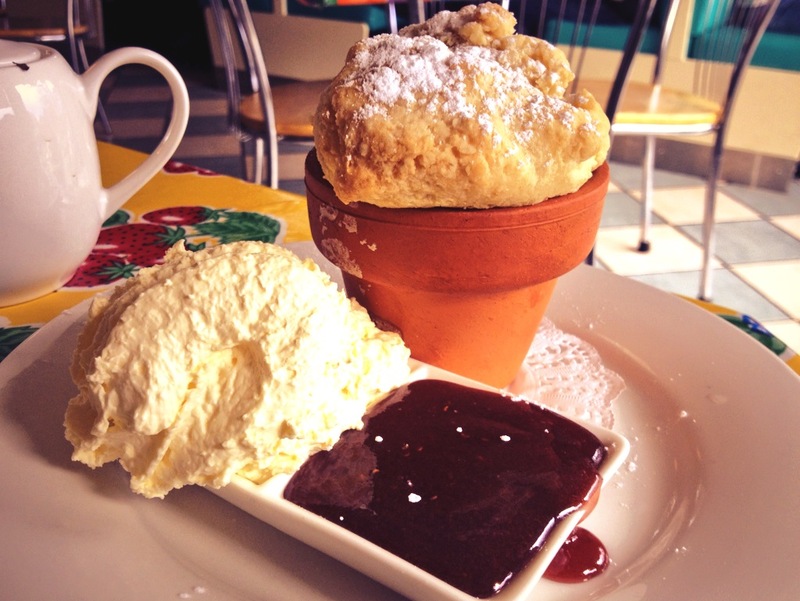 The scone is baked and served in a mini ceramic flowerpot and is ginormous, but I reason it’s like eating two ‘classic’ scones. The scone is a bit heavy; my buddy saying it tastes quite floury. The berry jam is slightly runny and the cream errs on the light side, but it definitely deserves a five-out-of-five for its cool presentation and you’re crazy if you don’t give it a try – it really is something quirky. Tea: A good and interesting variety of loose-leaf teas. I believe that a well-rounded guide offers a summary of not just the best of what’s around, but also the not-so-great. It’s a good way to compare and know when you’ve stumbled on something that little bit special. 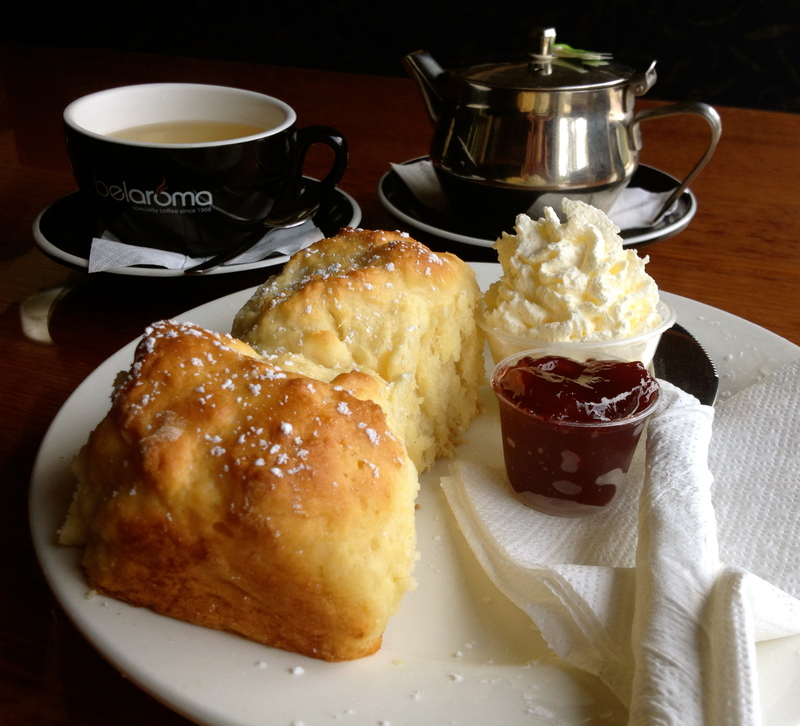 Aroma Cafe tucked away in a quiet street in Springwood, is a comfy cafe serving simple fare at affordable prices. 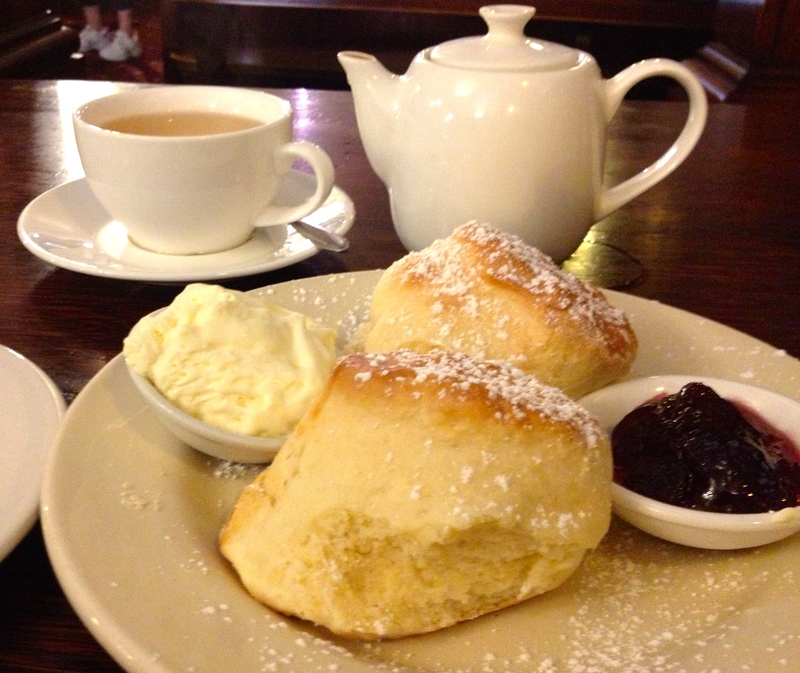 My Devonshire Tea comes in at a rock bottom $6.50, for one large scone and a pot of tea. Before you get excited, I must point out that I would prefer to spend twice that much for a higher quality spread. 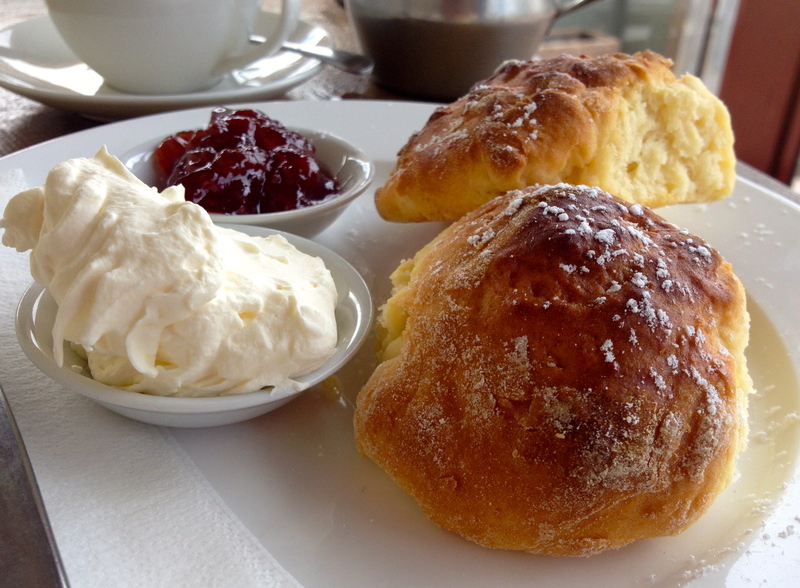 The single scone tastes more like a sweet breadroll than a fluffy scone, and I find it difficult to get through. The low quality jam is super sweet and the cream is super light straight from a can. If it’s price and a relaxed atmosphere you’re after than Aroma Cafe may be the place, but don’t expect an award-winning Devonshire Tea. Tea: A Twinnings tea bag served in a small teapot. Overall: Inexpensive but not high on quality. I was surprised to find this bright cafe tucked away behind the Lawson pub, which seems to dominate the village when you are arriving from the east. A lonesome sandwich board points potential customers in the right direction if you are walking down from the Great Western Highway, otherwise heading down behind the pub is the easier option to find the Ben Roberts Cafe & Gallery. While I sit waiting for my scones to arrive I wonder who is Ben Roberts? Apparently it’s the guy who built the original cottage in 1893, which housed local tradesmen of the time like the local boot maker. There’s no remnants of the old cottage anymore as the place is fully renovated and is a bit of an art gallery, although I don’t really notice much art as I am sitting in the glass-enclosed verandah, but I’m sure it’s there. It’s fairly quiet during my visit so I can hear what’s going on in the kitchen. I smile when I hear the whizz of the eggbeaters because that means fresh cream, but my shoulders slump when I hear the ding of the microwave. When my spread arrives it looks pretty good, although I’m not really impressed with the Nerada tea. I drink this at home as a basic standard tea, so I don’t want to pay for it at a cafe. The jam is pretty ordinary, but as I thought, the cream is freshly whipped. The scones aren’t bad, they are a little dry on top and have that microwaved thing going on, but they’ll definitely do. Tea: A variety of tea bag teas served in a pot. Overall: A pleasant place to chill out. 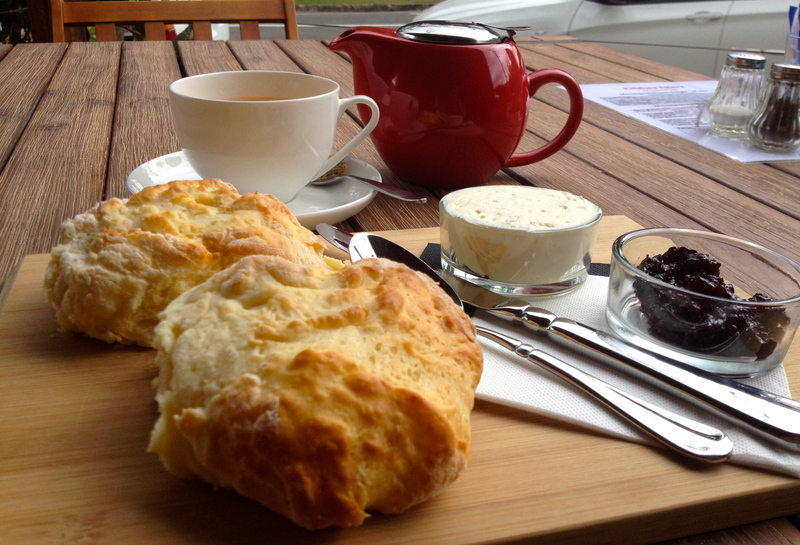 Set in the chilled village of Glenbrook, Cafe Cee is a simple cafe selling the usual suspects. If you’re watching your waistline you can opt for a half serve of scones, which will probably suffice considering the scone is massive! It may look impressive but it doesn’t taste great and is too salty. The jam and cream aren’t anything extraordinary. The scone could probably do with a bit more jam to give it flavour as it’s big and floury and needs it. Checkout the Devonshire Tea special on the board that gives you one scone plus any hot drink for $5.50 from 3 pm daily and all day Friday. Tea: A range of black and herbal loose-leaf teas. Overall: Don’t judge your scones by their size! I haven’t been to a cafe before that advertises a weekday and a weekend price side-by-side on the menu. Maybe they’ve had too many complaints from adding a weekend surcharge? I feel quite Bohemian, a bit like Byron Bay or Newtown 15 years ago, but rather than artists and alternate folk, it’s filled with an older demographic on a Friday lunchtime. I love it! The food looks awesome, but I can’t spoil my appetite. There are only plain scones today, but the waitress says they sometimes bake pumpkin and date ones. The scones are piping hot, crusty and fresh and there’s more than enough jam and cream. The vanilla/strawberry jam is divine and not too sweet, considering jam is fruit and sugar, and the cream is real whipped cream just as the menu promised. Overall: Don’t pass by without giving it a try. 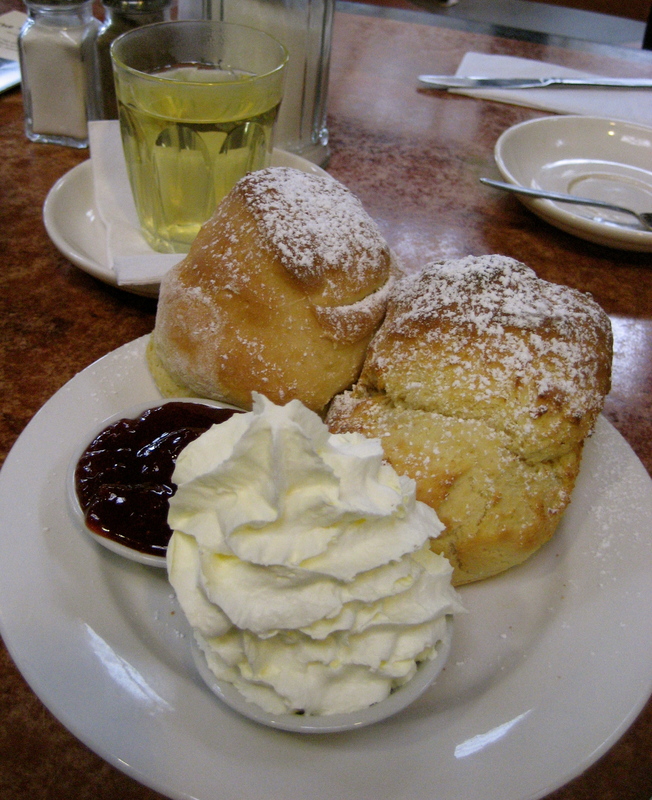 In Springwood I uncover yet another delicious Devonshire Tea tucked away off the main drag. 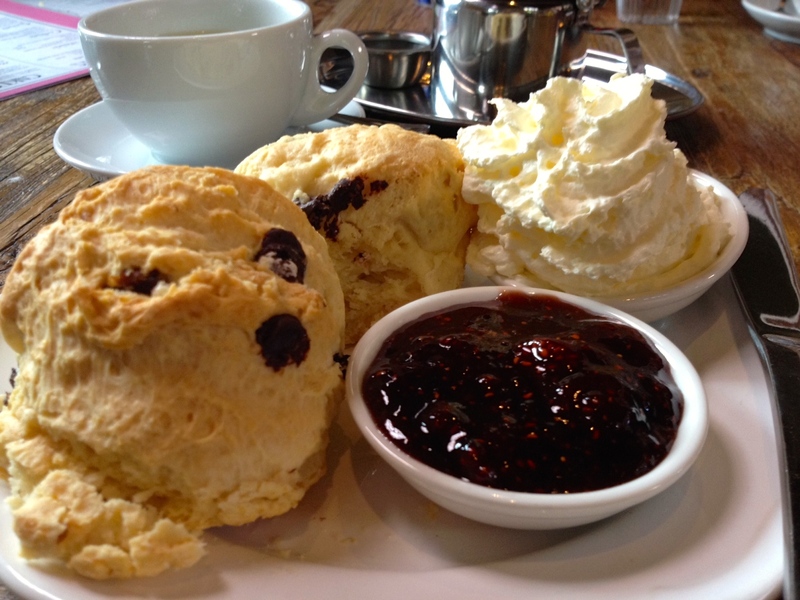 A cosy and popular cafe with plenty of windows to let in lots of light, Kemps Kafe is a good choice when you need to recharge the scone batteries. 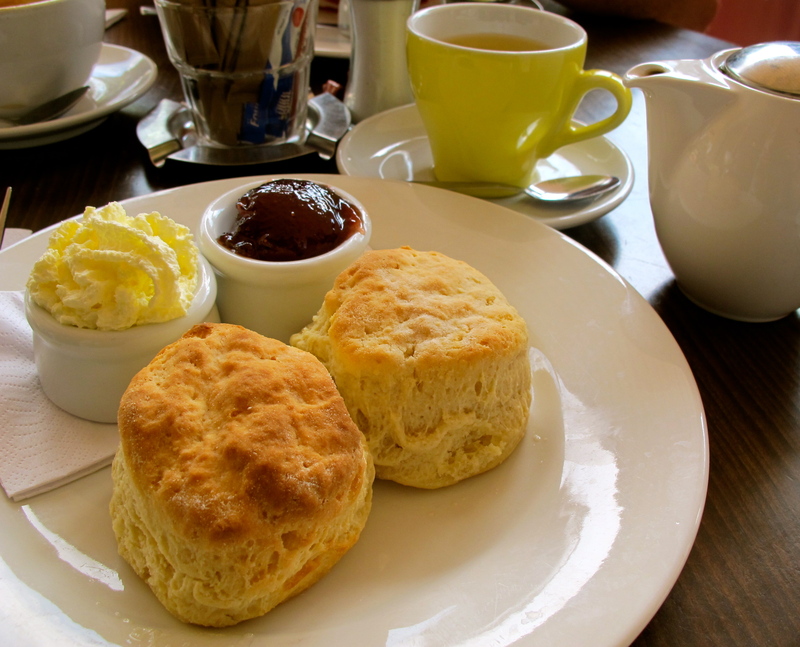 Depending on how hungry you are, either go for a serving of one or two scones then add a pot of tea. 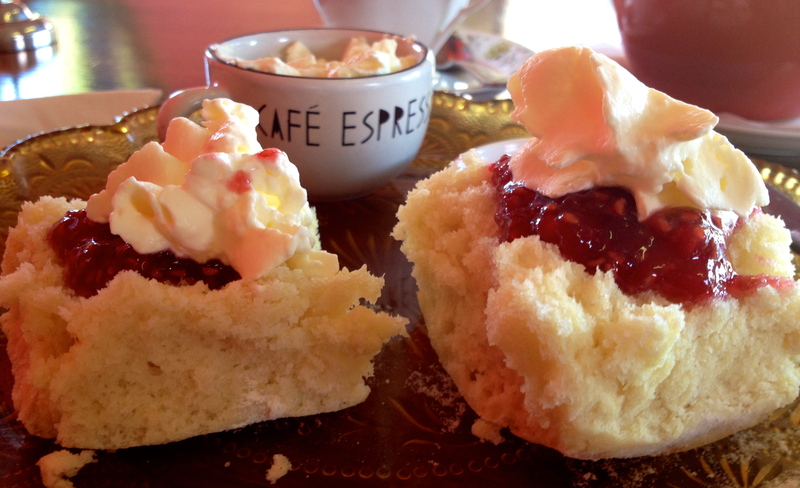 The scones are light, fluffy and creamy and the raspberry jam rich and tasty. Although the cream is freshly whipped, it’s very light; I’d prefer something thicker. Overall: Buzzy, bright and cosy. The late Norman Lindsay’s work as an artist, sculptor, writer and cartoonist is splendidly preserved and presented at his former home in Faulconbridge. The Norman Lindsay Gallery and Museum is home to the Magic Pudding and various other works, with the sandstone cottage and landscaped gardens now run by the National Trust. It’s an interesting foray for art lovers as well as those interested in sneaking a peek into the former artist’s decadent lifestyle. Perusing artwork and wandering through museums and gardens is tiring business, so how convenient is Lindsay’s Cafe then? Situated just where you need it – at the edge of the beautifully manicured and extensive gardens. The Devonshire Tea, although simple in presentation, offers a good balance of tasty scones, although I do detect a sweet aftertaste, and enough freshly whipped cream raspberry jam. The jam is good enough and the proportions of jam and cream to scones is perfect. It’s a lovely way to spend an afternoon in the lower mountains, but take note that the cafe can get very busy on weekends, so time your visit. Tea: An interesting variety of loose-leaf teas served in a small pot. Overall: A relaxing hidden enclave. More recognisable by the real estate office and the sign announcing the Round panorama, Mountain Blue Café could be mistaken for something else. Set in from the main highway on a street running parallel, it’s easy to miss, but the chrome chairs spread out on the footpath are a giveaway. I avoid the gift shop and the Aitken’s Australia in the Round which is a 360 degree painting depicting iconic Australian landscapes including flora, fauna and sand, housed is an annexe of the Mountain Blue Cafe. I’m only interested in the scones today, and although a bit crumbly they are good. The exception of course is the jam and cream, which are ordinary – the cream is too lightly whipped to make an impact. Maybe next time I’ll check out the annexe. Tea: A selection of teabags served in a small pot – not impressed that it was only three-quarters filled with water. Overall: Go deeper in to the village if you want a quieter experience. I’m surrounded by sketched pictures of John Wayne, Ned Kelly, Clint Eastwood, Elvis Presley and a whole bunch of other famous folk I fail to recognise, while watching a group of 60-somethings huddle around the life-like Elvis statue in the corner for photos. Mountain Blue Cafe Springwood, attached to a gift shop and real estate agent, is relaxing quiet today, apart from the Elvis fans. 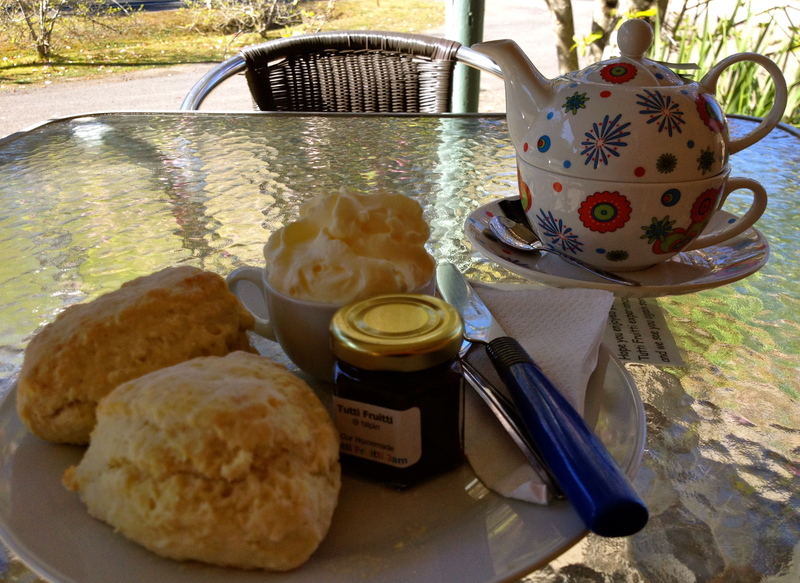 Although I’ve tried their other property in Glenbrook, I’ve decided to see how the Devonshire Teas rate here. 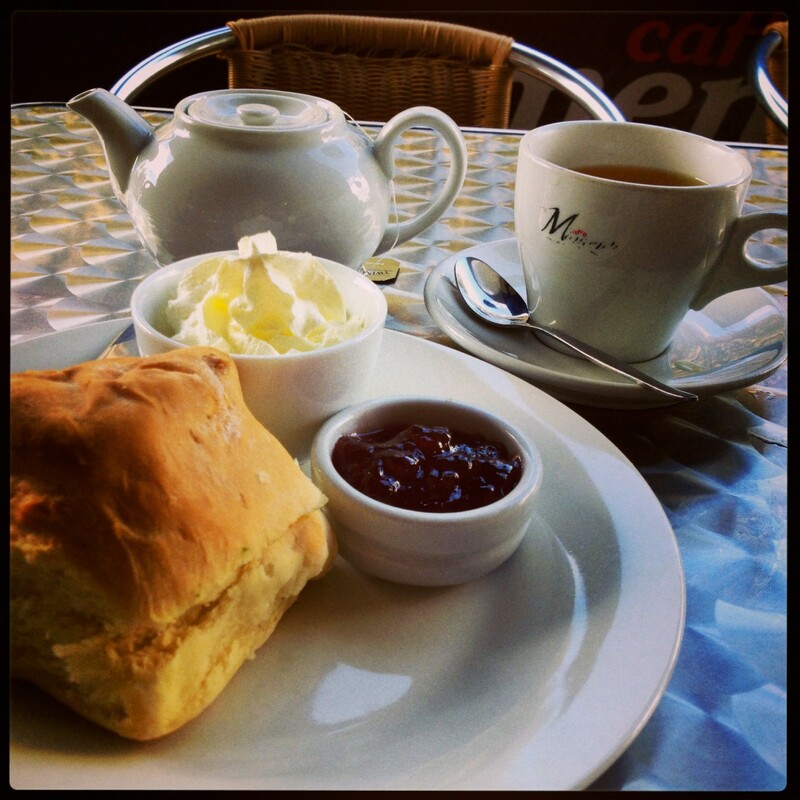 I’m not disappointed with the scones as they are simply amazing! Soft and fluffy with a creamy aftertaste, even the slight crumbling doesn’t bother. The jam is average and the cream, although fresh is a tad too light for me. If you are heading down from the mountains towards Sydney on the Great Western Highway, it’s a convenient place to stop. Tea: A small selection of teabags served in a small teapot. Aptly named, The Church in Glenbrook is literally a cafe within a church. It’s tiny, so most of the cafe spills out onto the footpath where umbrella covered seating and a more permanently covered/protected dining area allows diners to spread out. Indoors, there are some nice wall features and you can purchase Tea Craft teas and scented candles. It’s all chilled and relaxed as only lovely Glenbrook can be, tucked well enough away from the hectic highway starting its ascent up to the Blue Mountains. Order a couple of scones if peckish, as the scones are very small. They are also served unheated, which is okay because they are fresh and taste as though they are made with quality ingredients. The raspberry jam tastes homemade and is rich and tart, and there’s plenty of super thick cream. Be sure to wander through the giftware stores or venture into the Blue Mountains National Park for a bush walk before leaving the area. Tea: An interesting selection of Tea Craft loose-leaf teas served in a transparent pot so you can watch your tea leaves weave their magic. Overall: Thoughtful and appealing use of a cute and cosy church. I know it sounds strange, like something from an American mid-west movie, but I swear the people of Springwood are a happy bunch. This is only the second time I have bothered to divert the two minutes it takes from the Great Western Highway to this lower Blue Mountain hub, and I am pleasantly surprised. It feels nothing like the upper mountain towns, which are equally part tourist and part local, and nothing like from the plains of Sydney down the road, well at least not where I live on the lower north shore. It’s hard to describe, but I feel such a happy vibe that it feels kind of weird for me, everybody seems to be ‘smelling the roses’ rather than rushing from appointment to appointment. There are quite a few cafes in town, but it’s best to find them on foot as they are tucked away, like 2Blondes Cafe. On a drive by, I would have missed it as Michel’s Patisserie overshadows the cafe. I take a seat outside in the arcade, although there are a few tables inside, so I can enjoy the warmth. The scones aren’t on the menu, nor are they on a cake stand, and it’s just by chance that I notice ‘scones’ scribbled on the blackboard. They arrive slightly soggy on the bottom (I think they are from the freezer) but taste creamy and are soft and made of good quality products. The strawberry jam, a bit more please would be nice, has junks of real fruit and the huge pot of thickly whipped cream is superb! Tea: A selection of loose-leaf teas served in a decent-sized teapot. Overall: Tucked away cafe in a friendly mountain town. Just because the Bakehouse on Wentworth is tucked away along a quiet residential street in Blackheath, doesn’t mean that it’s lacking trade. On the contrary, the little bakehouse famous for its organic sourdough bread and gourmet pies is humming. If the weather is fine, take a seat in the front courtyard or when the winter chill sets in, there’s lots of room indoors. If you’ve got a sweet tooth like me, you’ll love the cakes and tarts, absolutely delicious! 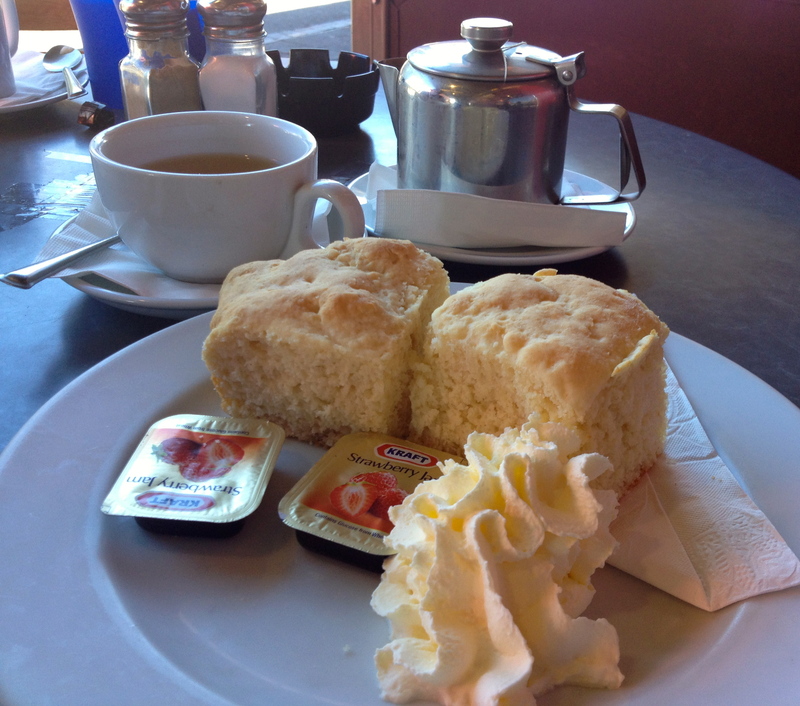 I am loading up on calories before I hit the Grand Canyon Circuit that leaves from Evans Lookout, so I am glad when I realise the Bakehouse does a Devonshire Tea. The scones are okay, but are a bit dry and a tad salty, and aren’t served with enough jam or cream. I’m not a fan of the portion-controlled jams and the cream is too light and aerated for my taste. I didn’t bother to ask for more jam and cream, and I am sure the friendly relaxed staff would be more than happy to oblige. Check out the Bakehouse’s other outlets at Glenbrook, Leura and Springwood. If you choose to sit outside expect the background noise to be not of birdcalls but of the busy traffic plying the Great Western Highway. Wattle Cafe is a bustling place with friendly staff and although all sold separately, can scrape together an okay Devonshire Tea. 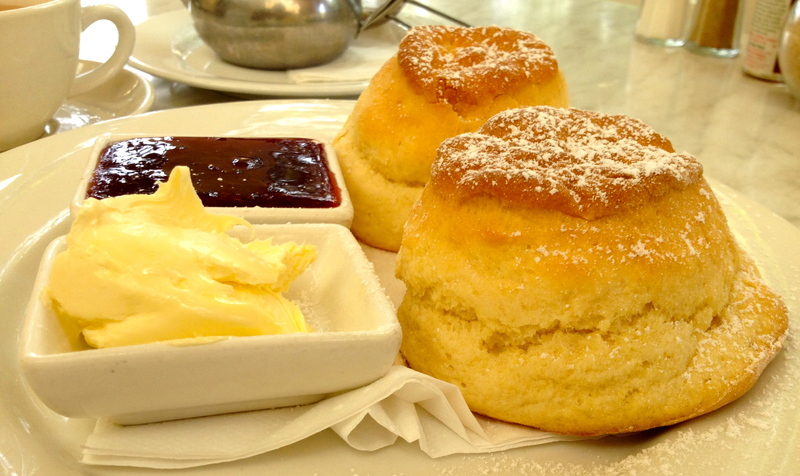 Although the scones are good – crispy on the outside and soft on the inside, the jam and cream let it down not only in quality but also in quantity served. I have to give points for the cup and saucer as it’s better than most. As I turn off the Great Western Highway and snake my way down to the Megalong Valley, I feel myself unwind to the sound of Whip birds floating through my car window. 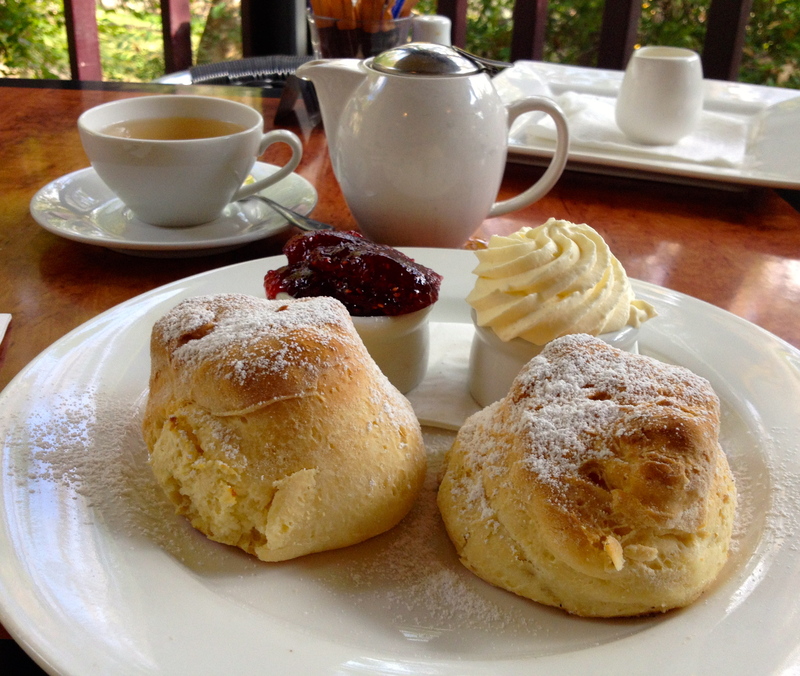 This is my second visit to the Megalong Valley Tea Rooms. My first was in the middle of winter and I shared the fireplace with a full house on a Sunday afternoon, but today its midweek and I share the huge garden area with only a few couples. In the distance the escarpment shadows the valley and I see the Hydro Majestic Hotel in Medlow Bath looking down upon us. Same as the first time round, the Devonshire Tea is five-star! 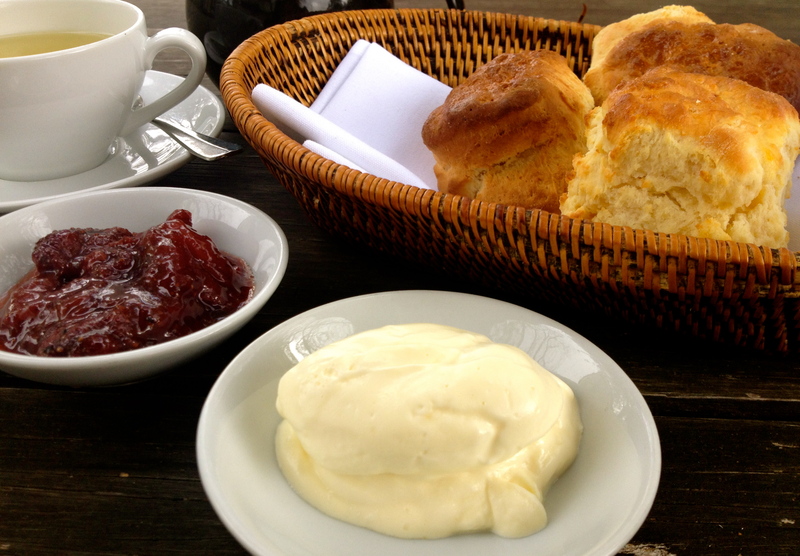 The three small fresh scones arrive in a basket alongside whopping of thick cream and fruity jam. The waitress tells me they hand whip their cream and prefer to, even though it takes longer – no can whipped cream here. 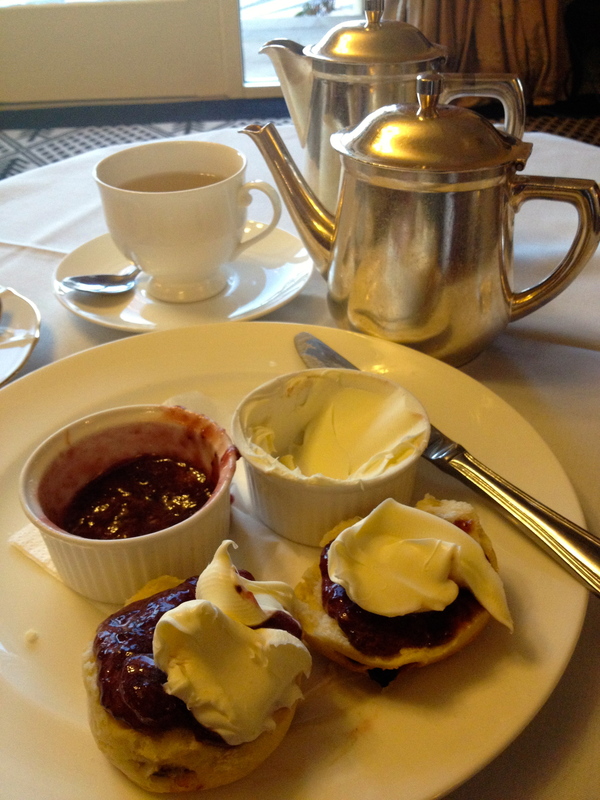 I think the jam is raspberry, but the waitress assures me its blackberry jam from Mudgee. I enjoy this delectable spread with a refreshing organic lemongrass tea. There’s a 10 per cent surcharge on weekends but the experience is well worth it and the diversion from the main drag in the Blue Mountains. Tea: A good variety of black, green and organic herbal loose-leaf teas served with extra hot water to top up the pot. Overall: Make an afternoon of it – it’s a gem. Historic Mt Victoria is a real treat; it’s tranquil and relaxing and doesn’t get the mass tourism like Katoomba and Leura. Along with the grand dames, the Victoria and Albert Guesthouse and The Imperial Hotel, train buffs will appreciate the ornate Mt Vic train station with attached museum (limited opening hours) and movie goers the cinema – Mt Vic Flicks – set in an old community hall with the real deal old cinema seats. Petalura Eatery has taken over the premises of the old Bay Leaf Cafe and Lolly Shop that was cute and cosy and highlighted the historic building. The new owners have revamped the building, knocking down walls and creating larger seating areas both indoors and out. Although it removes some of the ambience, I’m not complaining, as the deck area is a pleasant place to be on a summer’s day. The Devonshire Tea also presents well, delivered on a breadboard with plenty of thick whipped cream and although I require double the amount of jam, it is house made and divine. It’s blackberry today, but the menu says that they also serve strawberry jam as well. The scones are large and although fresh and tasty, crumble as I pull them apart. By the looks of things, it’s a popular spot for scones. 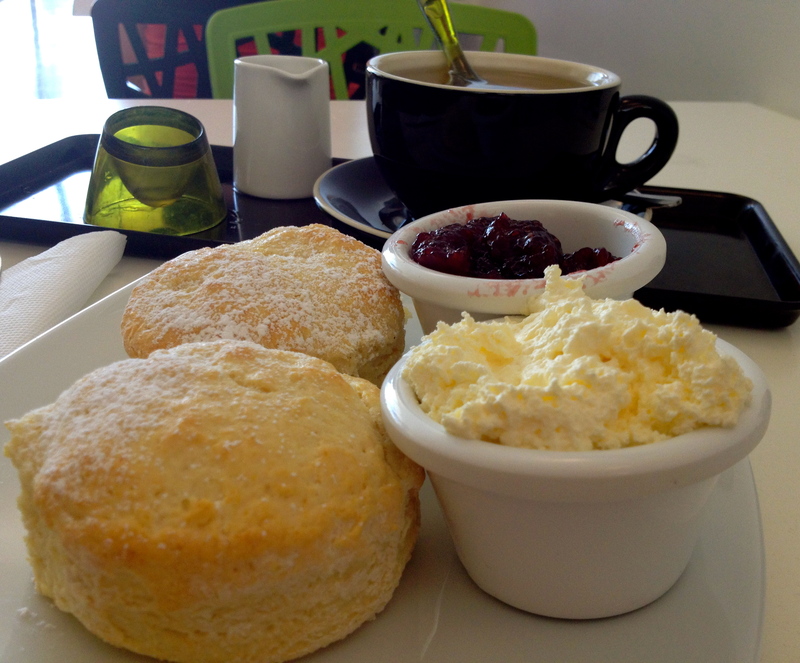 Open 8 – 4pm Thursday to Sunday, but be aware that the kitchen closes at 3pm and scones do sell out, so get in early. Tea: A variety of loose-leaf teas including some innovative herbal concoctions like ‘Vitality 4 Her’ & ‘Him’. Overall: A good stop on your way through Mt Vic. It’s midday on a Friday and the cafe – inside, outside, as well as upstairs where there is a bookshop/library – is full, and we’re almost turned away. We’re saved by a couple who have finished their coffees, and it’s our lucky day as the scones are delectable and shouldn’t be missed. The cafe is cosy and I ask myself why I have never bothered to check the menu on my countless trips through the village. I’m also glad that my buddy and I have decided to share as the scones are on the generous side. For those who like butter, there’s a serving along with the double thick cream and strawberry jam. Did I mention that the scones are light, fluffy and crispy on the outside? Absolutely scrumptious! Tea: A handful of loose-leaf tea choices served in a good-sized pot. 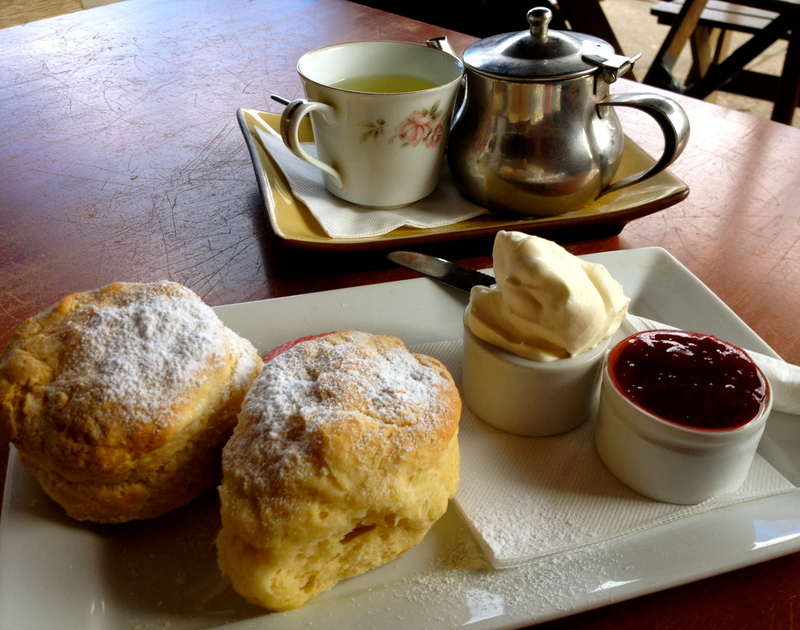 Overall: A ‘must-visit’ for scones in Wentworth Falls. The Conservation Hut Cafe is perched high above the Valley of the Waters in Wentworth Falls and is a great place to begin or end an invigorating walk in the area. The Hut is roomy, and needs to be, going by the number of diners on a busy Sunday afternoon. The Hut Devonshire Tea is a hearty affair and fills the gap after the lung-busting, thigh exploding hike if you are coming up from the valley. The fresh house-baked scones are big and crusty on the outside, and really should be served with at least three times the amount of jam. 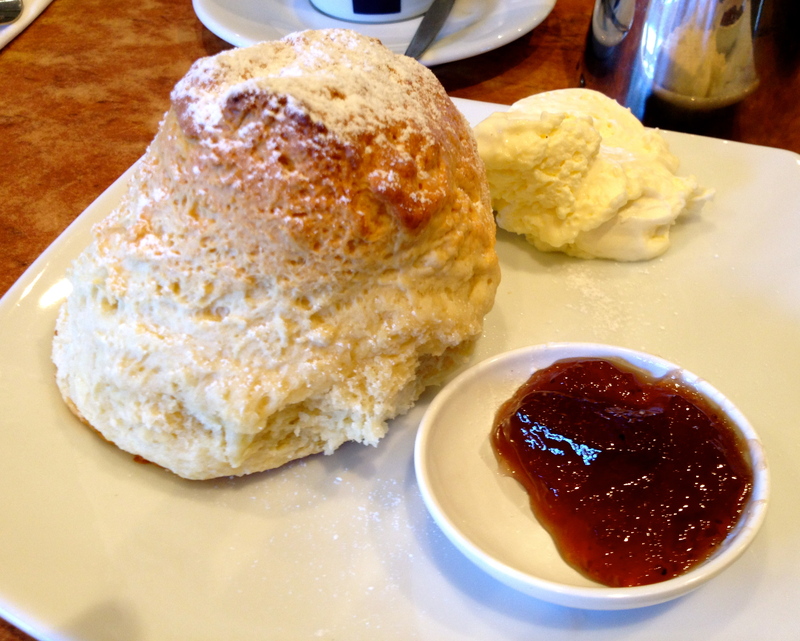 I still can’t fathom why it’s not obvious to the server – giant scones require a lot of jam! There is however sufficient cream but its way too light coming straight from a can to your plate. Not sure about drinking my tea out of a water glass either, a cup would be better. Tea: A good selection served in pots. Overall: A charming location with an impressive stone fireplace. Megalong looks to be the pick of the bunch! Yes Sonja, it sure is one of a very top few. Solitary Kiosk is good as well. 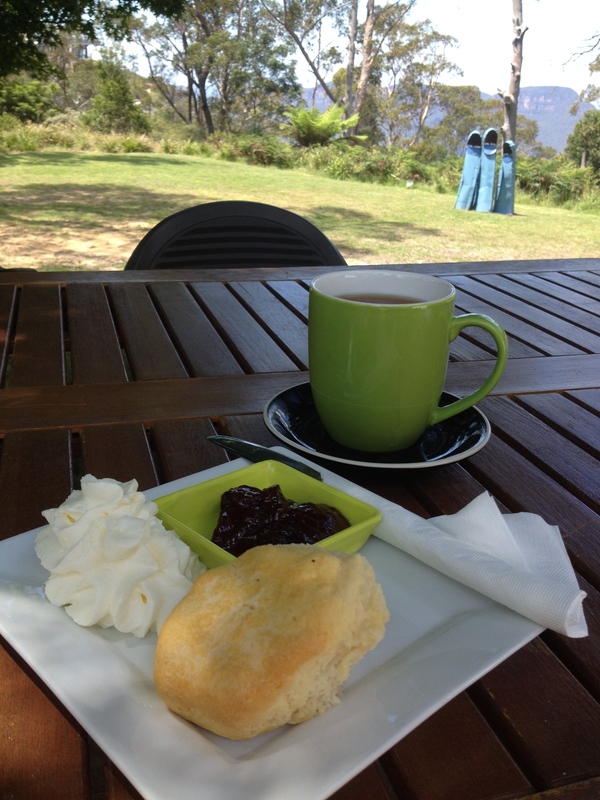 Went to Solitary kiosk yesterday and loved my devonshire tea. The jam had real vanilla beans in it, and they had a good selection of teas – I had Prince of Wales and my friend had a ginger chai. Both great. Thanks for your blog – love it! Nice one! Solitary Kiosk is a top spot, glad you made it there. I’ll have to go back when the weather is clear so I get the view. Good to hear you use the blog. Thank you.